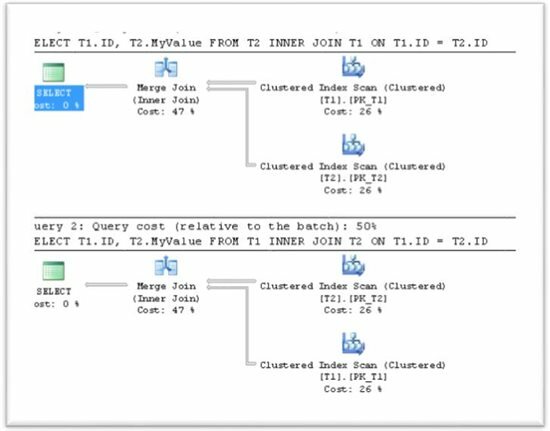 You can divide the task of "executing a query process around T-SQL" into two groups: (1) Processes that occur in the relational engine, and (2) Processes that occur in the storage engine. The relational engine is responsible for several processes: (1) parsing the query text, (2) processing the information using the Query Optimizer, which is responsible to generate the Execution plan, and (3) sending the plan (in a binary format) to the storage engine. The storage engine retrieves or updates the underlying data. The storage engine includes processes such as locking, index maintenance, and transactions. This article discusses the execution plan, which is generated by the Query Optimizer, while executing queries with Join operations. We will focus on one specific issue: in what order our Join operations will be executed, and how we can control it. We will show you techniques that you can put in your toolkit! We will discuss several different specific cases, from the simple query to more complex situations where the execution plan will depend on a lot of variables, such as the table's size and number of rows, the availability of statistics, indexes, key distribution, etc. In the last paragraph, we will try to summarize the golden rules that explain most of the common issues that you'll face. For this demonstration, we will create three tables. We will populate two tables with a very low number of rows (100 and 500) and the third table with a large number of rows (1000000). Let's examine the influence of the Join order in the query, to the Join operation order in the execution plan. First, we will check the JOIN using two small tables. Please execute the next queries and examine the Execution plan. >> You can repeat the execution of each query in this article with the setting "SET SHOWPLAN_ALL ON". This causes Microsoft SQL Server not to execute Transact-SQL statements. Instead, SQL Server returns detailed information about how the statements are executed and provides estimates of the resource requirements for the statements. Notice that while joining the two small tables of the same size order, the join order in the execution plan fits to the join order in our query. Will it be the same if we join tables that have a substantial difference in their amount of rows? Notice that the Query Optimizer has changed the join order from T3->T2->T1 into T1->T2->T3. This behavior fits our preview conclusion in Demo_01, that the execution order fits to the number of rows in our tables and our join operations are ordered from the smallest to the largest SET. The query optimizer should be intelligent enough to figure out the best order in which to execute the steps necessary to translate your logical instructions into a physical result. It uses the stored statistics that the database maintains on each table to determine what to do (what type of join logic to use for example), as well as what order to perform the operations in, in order to minimize Disk IOs and the processing costs. In some cases, we will need to have the Query Optimizer keep our query order of operations. The query optimizer uses different rules when exploring different plans to evaluate. For example: SelectToFilter, AppIdxToApp , JoinToIndexOnTheFly, JoinCommute, and so on. We can turn rules off using the rule name and the QUERYRULEOFF hint. The rule called JoinCommute is responsible to the join order in our case, and we can actually turn it off. The execution plan doesn’t expose the ability to selectively enable or disable rules available to the optimizer. We can, however, use a couple of undocumented DBCC commands and the undocumented dynamic management view (sys.dm_exec_query_transformation_stats) to explore the way the optimizer uses rules. (Check the "Resources and More Information" section, Inside the Optimizer: Constructing a Plan, by Paul White). The execution plan doesn’t expose the ability to selectively enable or disable rules available to the optimizer. It specifies that the join order indicated by the query syntax is preserved during query optimization. Using FORCE ORDER does not affect a possible role-reversal behavior of the query optimizer. We can examine the use of the "FORCE ORDER" hint on our queries. As expected, using the Force Order hint, both queries executed in the order that the queries were written. In this section, we are going to examine the behavior of three tables in relation to one another. We will start with DDL + DML, and then we will move to discuss several JOIN cases related to those tables. * The execution plan is the same as in the preview query. * in this query we use a filter which actually do not filter any row out. It is only used for re-ordering the JOIN order. We can force the optimizer to process a derived table by simply placing a GROUP BY in your derived table. The optimizer is then obligated to resolve the GROUP BY aggregate before it can consider resolving the join between the two tables. * This article is based on SQL Server 2014 Enterprise edition, using a small virtual machine with 2 CPUs and 4 GB of shared memory, on Windows Server 2012 R2. * We can't always predict the join order, and you might get different results from those shown in this article! We saw that the execution plan depends on lot of variables, such as table size and number of rows, availability of statistics, indexes, key distribution, etc. Moreover, we have a lot of options to change order of operation or even the whole Execution plan by using hints and/or writing the same query with a slightly different format. By default, JOINs are done in left to right order. Tables with less amount of rows pushed to the beginning of the process. In extreme situations with complex JOIN query, The Optimizer may fail to find the best solution, and it build an Execution Plan with order of operation almost similar to the original query. We can try to change the order of JOINs in the query. We can control the Join Order using hints as QUERYRULEOFF JOINCOMMUTE, FORCE ORDER, etc. We can use different Join hints to control the type of join, which have side effect of changing the join operations order as well. We can control order of operation by using Brackets, Filters, GROUP BY, and so on. * Very nice blog, clear and intuitive explanation.